When I chose the “Roads” theme I was thinking not only of highways, roads and pathways occurring in our physical environment but also of roads we might travel or may have travelled throughout our lives, metaphorically speaking. For this piece, I took inspiration from roads in landscapes by other artists and from photos of roads and highways near my Central Alberta hamlet. 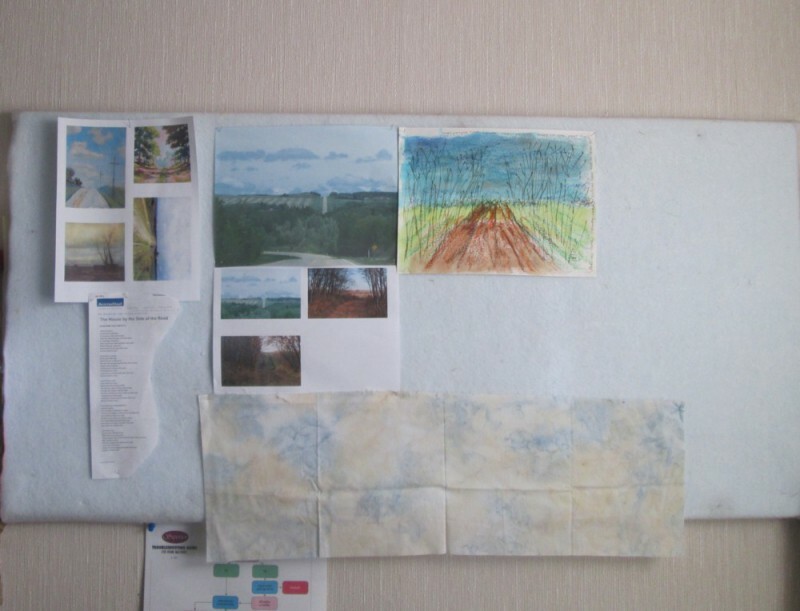 On my design wall you can see a variety of inspirations: the paintings of other artists, a poem about “A House at the Side of the Road”, photos I’d taken of roads and paths nearby and a rough sketch. I decided to make my source the large photo (top centre, above) of Highway 50 going ‘Uphill to Mirror’. 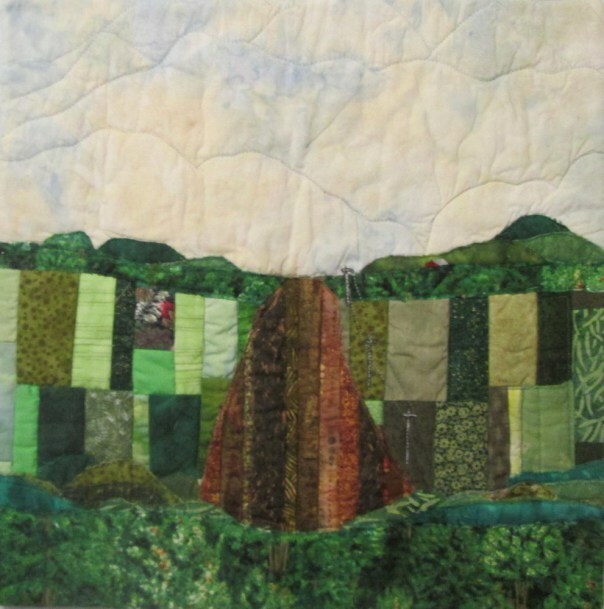 I used the large piece of fabric shown at the bottom as my sky, and decided to create pieced fabric for both the roadway and the fields, with fused applique shapes for the trees. I ran into some difficulty when I began the quilting — my free-motion foot skipped stitches when I tried to go backwards or sideways. This proved problematic for quilting the sky. I took the stitches out three times before I gave up and switched to my walking foot and did more gentle curves to create the impression of building clouds. Another issue: a spot of what seemed to be glue from fusible web, stuck on a seam on one of the pastel green pieces of the “fields”. It was a delicate task to remove it, and required washing the piece (trimmed but not yet faced)…and then drying it — in the drier! In the end, no damage was done, and the clouds look particularly…”cloudy”…as a result! I’d face the piece and thought it was finished but no…something about it wasn’t quite right. It was rather ‘flat’. Something was missing. 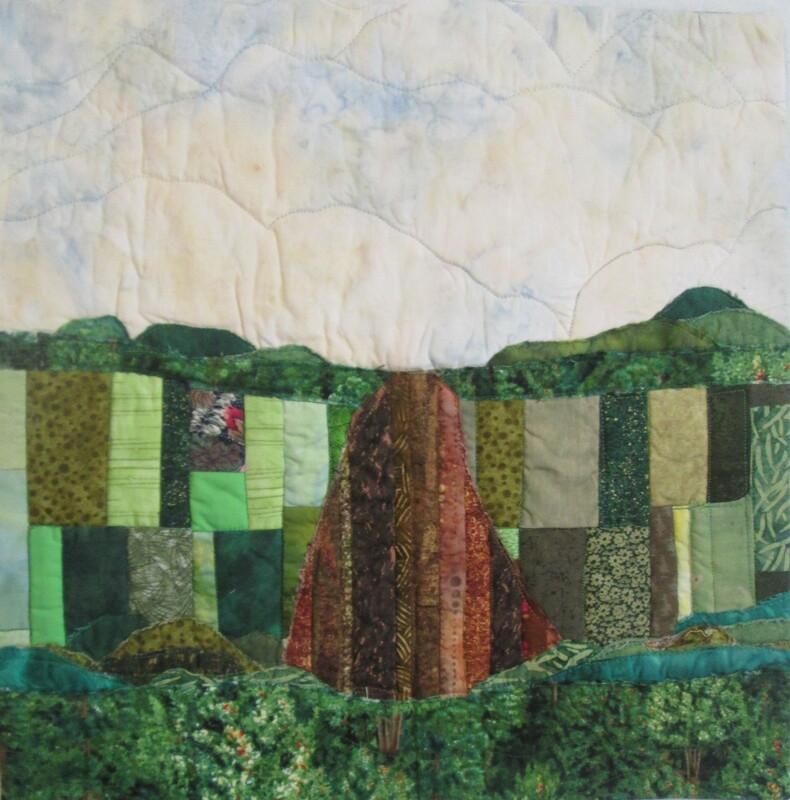 Enter Joan Statz, a local area quilter who specializes in stylized landscapes with a rural ‘feel’. I had the privilege of meeting her in her home recently to hand over a section of the SAQA 25th Anniversary Trunk Show for her to share with her guild in Stettler. When I went to pick it up, I took several of my 15 x 15 pieces to show her, and we discussed “Uphill”. She agreed with me. As we chatted about the piece it came to me that there were no structures in it, even though there were in the original photo. Power poles! That’s the ticket! And maybe the roof of a building up behind the trees. I confess I was nervous about it. The pieces would have to be very tiny to keep the proportions. Based on her experience, she gave me some tips about how to add such details…et voila! Margaret, thank you for sharing your design process and like you say there was something missing and the addition of the fine detail pulled everything together, good choice of fabric and technique. It is always interesting to see how things have been worked and you are always so ready to share your experiences, love the colour combinations.